It is said to get its name from the Austrian inventor of the hitch, Karl Prusik. Easy to tie and use this is an indispensable knot that has way too many uses to list. To make the endless loop, also called a Prusik loop, which is needed to tie a Prusik hitch use a double fishermans knot. The version shown here is a two wrap Prusik hitch. If more friction is needed the this can be achieved by adding an extra wrap around the climbing rope. 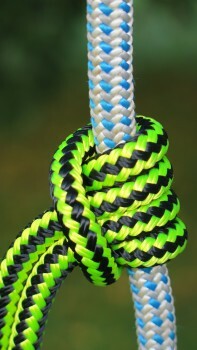 This will give six turns around the climbing rope as opposed to the four shown here. They are also a bit confusingly known as four and six wrap Prusiks. The cordage used to make the Prusik loop needs to equal to or smaller than the diameter of the climbing rope and it needs to be made from a material that is suitable to use as friction hitch cordage.